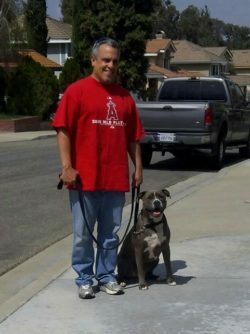 Leader of the Pack provides private local dog training at your home. Who’s the best dog trainer for your dog? You are! Would you like to create an amazing relationship with your dog, who wants to obey you, all without the use of choke, pinch or shock collars or lots of treats? While some methods of dog training rely on taking your dog to a board and train environment, away from you and your home, train them by inducing pain or discomfort and confined in a kennel. This acclaimed training program methods empowers you with the insight you need to become your dog’s pack leader and trainer. At your home dog training, in your environment and empowering you to train your dog without force is what we do! Once the role of pack leader is fulfilled by you, most other issues and concerns will fall naturally and easily into place. All the dog training tips in the world won’t matter if your dog doesn’t view you as his pack leader. Dogs have an innate need for the social structure and security of a pack, so in order to maintain a peaceful existence, dog owners must learn to confidently lead the pack. Leadership has nothing to do with being “dominant or alpha” it’s about being a great mentor. The bottom line is this: Dog behavior issues almost always stem from lack of consistent leadership and training. Pack leadership isn’t difficult to achieve, it simply requires a basic understanding of the pack leader mindset and consistent use of a few, straight forward techniques. We can accomplish all of the training without the use of pinch, choke or shock “vibration” collars. Your dog should behave and obey you because they WANT TO! Leadership, Obedience Training, Behavior Modification, Socialization & AKC Canine Good Citizen. Training for the real world. The training is comprehensive, we focus on behavioral issues, obedience training and socialization with other dog’s and people. We start off the training in your home, where your dog learns the best and where they need to behave. Our acclaimed training methods are natural, dog-friendly, effective and kind. We do not use pinch, choke or shock collars. The first lesson is about 3 hours long, designed to give you as much information and training as possible, so that you have the tools to get results right away. I will help you assess your current household dynamics, daily routine and nutrition that may influence your dog’s behaviors. After making any necessary adjustments, we’ll then teach you methods of canine communication that will help you lead your dog with confidence and ease. Again on the first lesson, depending on the age of your dog, we will teach the obedience commands; sit, stay, come, down and heel (walking next to you without pulling), we will then work on home manners and the specific behavioral issues you want to address right away. Aggression, Sibling Rivalry and Separation Anxiety require follow-up lessons. Understanding Canine Communication & Pack Structure Behavioral Presentation: Does your dog misbehave, ignore or disrespects you? Does your dog think he’s in charge? We teach owners effective leadership techniques. Leadership=Mentorship. Pack structure is very important to dogs, if we’re not in-charge, they will be. Dog’s feel safe and secure with operative leadership. Understanding pack structure, leadership and canine communication will dramatically change the dynamics in a human/dog “pack”. All training programs include this amazing education, which resolve dog behavioral problems. The follow-up lessons are one hour long and scheduled at the end of each lesson. After the home issues are resolved, we start working on socialization, going on outings to public areas around other dog’s and people to teach your dog to be comfortable in any setting. AKC Canine Good Citizen Title. At the end of the training, if you wish, we’ll test for the American Kennel Club, Canine Good Citizen test! Contact me for additional information on the program that’s right for you and your dog. We can accomplish a lot right away! Includes 4 hours of private dog training. We will teach you how to provide leadership, obedience & manners to your dog. This program is designed to help you with your dog that has behavioral issues such as, door rushing, barking, jumping, playful lunging, potty training. They will also learn the obedience commands heel, stop/sit, come, down and stay. For aggression, sibling rivalry and separation anxiety, refer to the Gold Program. Initial 3 hour training session at your home. Understanding Canine Communication and Pack Structure Behavioral Presentation. Behavior modification. Door rushing, barking, jumping on people and furniture, lunging on leash, etc. Follow-ups: One – 1-hour training session at your home. Four hours of private training at your home. Leadership for Owners. Basic & Advanced Obedience Training, Dog Behavior Modification, Socialization Training & AKC Canine Good Citizen (Therapy Dog). This program is great for all dogs, but especially dogs that have behavioral issues (aggression, sibling rivalry, separation anxiety) and lack socialization. Also great for owners that want to truly advance their dog’s obedience, socialization and achieve the Canine Good Citizen. This program includes intense Behavioral and Obedience Training, Socialization and the American Kennel Club (CGC “Canine Good Citizen” Training and Testing. This program is for those that want to have a well-trained, socialized and obedient dog, that they can feel confident taking anywhere! Training manual designed to keep you on track. Initial one 3 hour training session at your home. Behavior modification. Door rushing, barking, jumping on people and furniture, lunging on leash. These behavior’s take longer to correct; aggression, sibling rivalry and separation anxiety. Eight hours of private training at your home and in social settings to help your dog be reliable no matter where you go. AKC Canine Good Citizen Training & Testing. One year training, email and phone support. 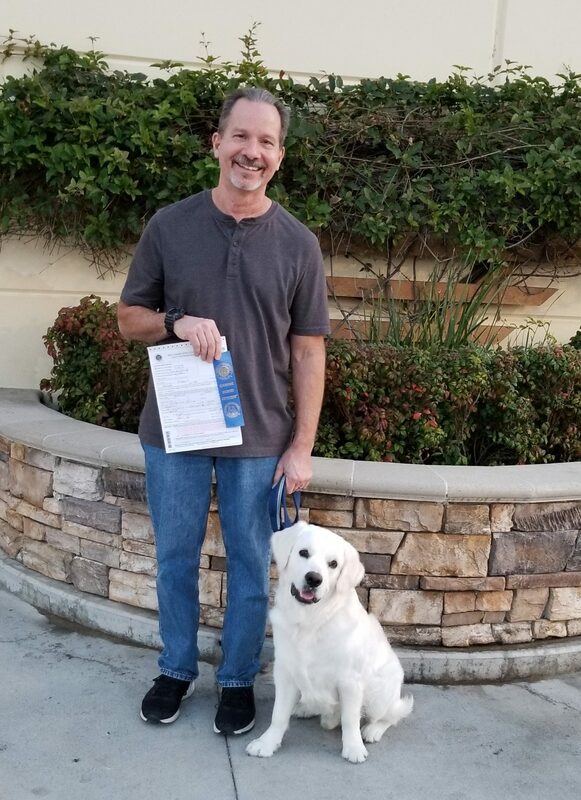 Brody Achieves the AKC Canine Good Citizen! Puppy Training. Leadership for Owners. Basic & Advanced Obedience Training, Dog Behavior, Socialization Training & AKC Canine Good Citizen (Therapy Dog). 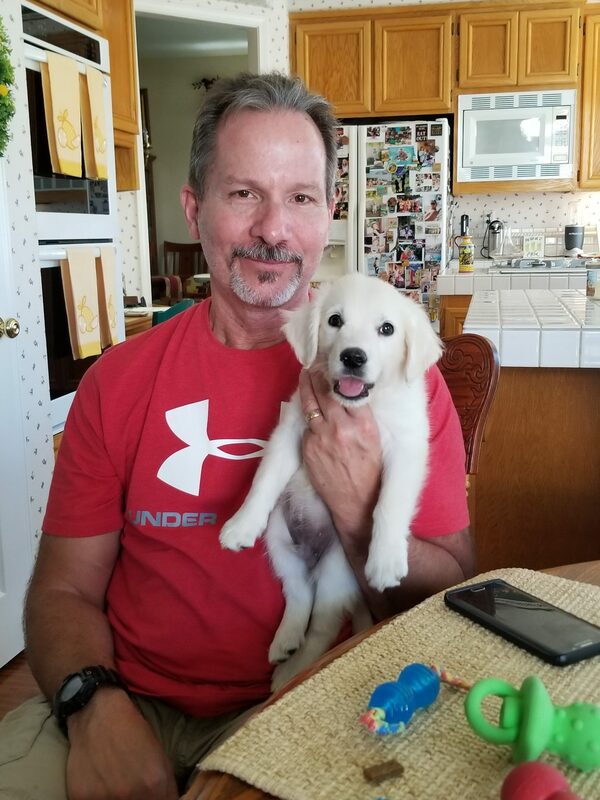 No need to wait until your puppy has all his shots – I come to your home! Start off on the right Paw with your Puppy! The ultimate puppy package! This program also provides puppy raising, crate training, toileting, nipping & biting and basic obedience, along with the Gold Program support. Because it takes time to train a puppy, we provide support from the time you bring home your puppy. We start with teaching your puppy toileting, crate training and to set your expectations, they can learn sit, come and to walk on a loose leash right away. Once your puppy begins to mature, we can focus on the more advanced training. It’s important to have realistic expectations with puppies. “You can’t train a puppy out of a puppy”. You will raise a very happy, well-behaved, socialized and obedient dog! American Kennel Club, Canine Good Citizen training and testing is provided and a good goal to achieve! 9 hours of private training. Initial 2-3 hour training session at your home. Ten hours of private training at your home and in social settings to help your dog be reliable no matter where you go! AK Canine Good Citizen Training & Testing. Included in both Gold Programs. If you can pass this test, you’ll have a very well socialized, obedient dog that you will feel confident taking anywhere! Wendy Blanch is an AKC Certified CGC Evaluator – #71054. The CGC Program is designed to reward dogs who have good manners at home and in the community. The Canine Good Citizen Program stresses responsible pet ownership for owners and basic good manners for dogs. All dogs who pass the 10-step CGC test will receive a certificate from the American Kennel Club.